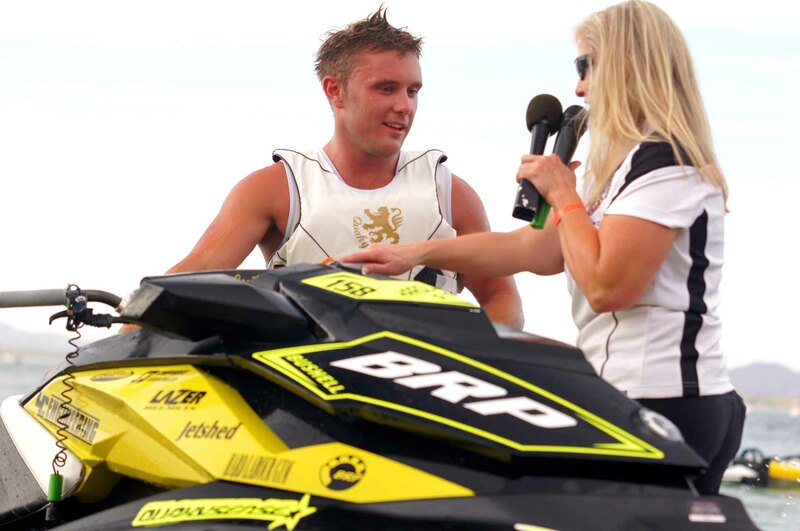 Valcourt, QC, CANADA – BRP is proud to announce that multiple watercraft racing World Champion, James Bushell will be competing on the 2013 US IJSBA National Tour aboard his 158-Performance backed Sea-Doo RXP-X. Bushell of the UK has won back-to-back IJSBA PRO Open and PRO GP World Championships in 2011 and 2012 since teaming with legendary Sea-Doo tuner Les Cooke of Australia’s Sea-Doo Centre. Bushell will compete in the PRO Open class aboard a modified Sea-Doo RXP-X in all seven 2013 tour rounds. Bushell has competed around the world including Europe, Dubai, Thailand, and others and has dedicated his 2013 season to challenging the best of the United States. Bushell is no newcomer to winning championships with a long and impressive resume as he looks to complete his long list of racing accomplishments by contesting the US National Tour. He was an integral part in the launch of the new Sea-Doo RXP-X platform in 2012 as he was the featured talent for print and video promotional materials. Bushell also teamed with Les Cooke early in 2011 to develop the racing elements of the Sea-Doo T3 hull that would later shock the world with two dominating performances at the IJSBA World Finals in October of that year. The Sea-Doo RXP-X is equipped with designs and technologies that make every rider a better rider. The exclusive Sea-Doo T3 hull design tracks straighter through choppy conditions and combined with the Ergolock system, allows the rider to turn tighter with less effort. These exclusive BRP designs and the power of the Rotax 4-TEC Supercharged HO marine engine give the rider a clear performance advantage. Riders can utilize the power more efficiently in all areas of high performance riding minimizing fatigue, cornering faster and seemingly shortening the racetrack compared to the competition. “I am coming to the US to show that Sea-Doo watercraft are the best PWC on the market and to shake things up as some other racers have won the tour for too many years. I want to win!” concluded Bushell. James Bushell will be basing out of Greensboro, North Carolina traveling with the Optima Racing team. His 2013 efforts will be supported by; 158 Performance, Sea-Doo Centre, Jet Tribe, and SB Components.